Usable lifetime and capacity of a secondary battery used in power supply systems of marine aids to navigation depends on the actual operational conditions and, in particular, on the charging process. To achieve the maximum usable lifetime, the charging system has to maintain the batteries as fully charged as possible while not overcharging them. Overcharging would result in boiling out of the electrolyte, damaging the batteries. Cybernetica AS has applied special efforts to find the most efficient methods of charging the AtoN batteries. 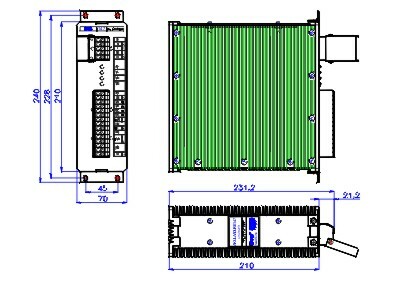 As a result, the optimizing AtoN Battery Charger E147 was developed. The purpose of the charger is to guarantee continuous energy supply of autonomous and local AtoN site systems powered from 220 V/50 Hz utility power and charging in buffering mode the lead acid or gel based batteries with a parallel fluctuating load of up to 100 W. Operation of the system is allowed even with the battery disconnected. When optimizing the charging process the type, nominal voltage, capacity, and the charge factor of the battery as well as temperature of the ambient air are taken into the consideration. The optimization algorithm is executed by a programmable microcontroller. The charger is ready for integration into a remote control and monitoring system for full utilization of its diagnostics capabilities. Download the E147 catalogue page in Adobe pdf format. Please do not hesitate to contact us for more information and price quiotations. We may also be able to offer product customization and design services to accommodate your unique requirements.